The People of the Abyss (1903) is a book by Jack London about life in the East End of London in 1902. He wrote this first-hand account after living in the East End (including the Whitechapel District) for several weeks, sometimes staying in workhouses or sleeping on the streets. In his attempt to understand the working-class of this deprived area of London the author stayed as a lodger with a poor family. The conditions he experienced and wrote about were the same as those endured by an estimated 500,000 of the contemporary London poor. London also used the expression "the people of the abyss" in his later dystopian novel The Iron Heel (1907). 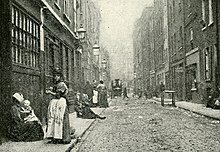 There had been several previous accounts of slum conditions in England, most notably The Condition of the Working Class in England in 1844 by Friedrich Engels. However, most of these were based on secondhand sources. Jack London's account was based on the firsthand experience of the writer, and proved to be more popular. Jacob Riis's sensational How the Other Half Lives (1890) has been suggested as a source of inspiration for The People of the Abyss. A contemporary advertisement for Jack London's book said that it "tingles" with the "directness only possible from a man who knows London as Jacob Riis knows New York," suggesting that his publisher, at least, perceived a resemblance. When London wrote The People of the Abyss, the phrase "the Abyss," with its hellish connotation, was in wide use to refer to the life of the urban poor. H. G. Wells's popular 1901 book, Anticipations, uses the expression in this sense some twenty-five times, and uses the phrase "the People of the Abyss" eight times. One writer, analyzing The Iron Heel, refers to "the People of the Abyss" as "H. G. Wells' phrase." George Orwell was inspired by The People of the Abyss, which he read in his teens, and in the 1930s he began disguising himself as a derelict and made tramping expeditions into the poor section of London himself, in emulation of Jack London. The influence of The People of the Abyss can be seen in Down and Out in Paris and London and The Road to Wigan Pier. The British newspaper journalist and editor Bertram Fletcher Robinson wrote a review of The People of the Abyss for the London Daily Express newspaper. In this piece, Fletcher Robinson states that it would be "difficult to find a more depressing volume." ^ The novel is set in the United States; the "people of the abyss" are described as "men, women and children, in rags and tatters, dim ferocious intelligences with all the godlike blotted from their features and all the fiendlike stamped in, apes and tigers, anemic consumptives and great hairy beasts of burden, wan faces from which vampire society had sucked the juice of life, bloated forms swollen with physical grossness and corruption, withered hags and death's-heads bearded like patriarchs, festering youth and festering age, faces of fiends, crooked, twisted, misshapen monsters blasted with the ravages of disease and all the horrors of chronic innutrition—the refuse and the scum of life, a raging screaming, screeching demoniacal horde" (quoted in Theodore Dalrymple, "The Dystopian Imagination," in Our Culture, What's Left of It (Chicago: Ivan R. Dee, 2005)}, p. 106. ^ Shaw, Albert (11 November 2017). "The American Monthly Review of Reviews". Review of Reviews. Retrieved 11 November 2017 – via Google Books. ^ Wells, H. G. (1999) . Anticipations of the Reactions of Mechanical and Scientific Progress Upon Human Life and Thought. New York: Courier Dover Publications. ISBN 0-486-40673-3. Wells sees "the Abyss" as a distinctly "urban" phenomenon. He calls its constituent members a "wretched and disorderly" "people of extinction" and regards the cause of its existence to be "machine-superseded toil." "At present the Abyss is a hotbed breeding undesirable and too often fearfully miserable children" (Ch. 9, "The Faith, Morals, and Public Policy of the New Republic"). Wells is extremely critical of philanthropic efforts: "Under the really very horrible morality of to-day, the spectacle of a mean-spirited, under-sized, diseased little man, quite incapable of earning a decent living even for himself, married to some underfed, ignorant, ill-shaped, plain and diseased little woman, guilty of the lives of ten or twelve ugly children, is regarded as an extremely edifying spectacle, and the two parents consider their reproductive excesses as giving them a distinct claim upon less fecund and more prosperous people. Benevolent persons throw themselves with peculiar ardour into a case of this sort, and quite passionate efforts are made to strengthen the other against further eventualities and protect the children until they attain to nubile years. Until the attention of the benevolent persons is presently distracted by a new case.... Yet so powerful is the suggestion of current opinions that few people seem to see nowadays just what a horrible and criminal thing this sort of family, seen from the point of view of social physiology, appears" (Ch. 9). Wells used the phrase again in Chapter 3 of Mankind in the Making (1903). ^ Rideout, Walter B (1992). The Radical Novel in the United States, 1900-1954. Columbia University Press. ISBN 0-231-08077-8. "London focuses his climax on 'the People of the Abyss'—H. G. Wells' phrase now appears as a chapter title" (p. 44). ^ Shelden, Michael (1991). Orwell: The Authorized Biography. New York: HarperCollins. ISBN 0-06-016709-2. p. 62. Orwell read The People of the Abyss while at St. Cyprians; London's book was a "definite source of inspiration"; Orwell "was following its example" (p. 121). ^ "difficult to find a more depressing volume". Ashburton Guardian. January 9, 1904. p. 2.